HMS Glasgow was a Type 42 destroyer of the Royal Navy. The last of the Batch 1 Type 42 destroyers, Glasgow was commissioned in 1977. The destroyer fought during the Falklands War, and on 12 May 1982 was damaged by a bomb from an Argentine A-4 Skyhawk. 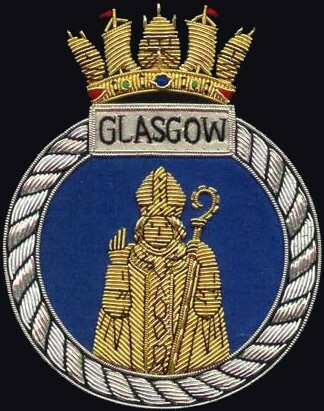 Glasgow operated with the INTERFET peacekeeping task force in 1999, and was deployed on the Atlantic Patrol South tasking in 2004. The destroyer was decommissioned in 2005 and was broken up for scrap in 2009. She was built at Swan Hunter Shipyard in Wallsend, Tyneside and launched on 14 April 1976 by Lady Kirstie Treacher, wife of Admiral Sir John Treacher. With a displacement of 4,820 tonnes, Glasgow was the sixth and last Batch 1 Type 42 destroyer in the fleet. Named after the Scottish city of Glasgow, she was the eighth ship to bear the name. On 23 September 1976, while being fitted out, a fire on board killed eight men and injured a further six. The ship was commissioned into the Royal Navy on 25 May 1977. Glasgow was among five Type 42 destroyers sent as part of the Task Force sent to retake the Falkland Islands after invasion by Argentina in 1982. Armed with Sea Dart anti-aircraft missile system, Glasgow along with her sister ships, Sheffield and Coventry were among the first ships to arrive in a 200-nautical-mile (370 km; 230 mi) exclusion zone imposed by the British around the islands. Glasgow saw early action in the war when, on 2 May, her Lynx helicopter severely damaged the Argentine naval vessel Alferez Sobral. On 4 May, Glasgow detected an Exocet missile fired at the Task Force and warned the fleet. However Sheffield failed to receive the warning and was hit, later sinking. Down to two Type 42s (Exeter and Cardiff would not arrive until the end of May), Glasgow and Coventry were left as the long range defence of the fleet. On 12 May, Glasgow and the Type 22 frigate Brilliant were on a "42-22" combo; Glasgow's Sea Dart long range missiles would complement Brilliant's short range Sea Wolf missiles on anti-aircraft attacks. The ships attracted the attention of the Argentine Air Force, and a wave of four A-4B Skyhawk jets of Grupo 5 attacked. Although Glasgow's Sea Dart system failed, Brilliant's Sea Wolf shot down 1st Lt Oscar Bustos (C-246) and Lt Jorge Ibarlucea (C-208), whilst Lt Mario Nivoli (C-206) crashed into the sea evading a missile. All three pilots died in the action. When a second wave of Grupo 5 Skyhawks attacked, Brilliant's Sea Wolf failed and the jets each released three bombs. One bomb from Skyhawk (C-248) piloted by Lt Gavazzi, damaged Glasgow, although it did not explode, passing clean through the aft engine room, damaging fuel systems and disabling the two Tyne cruise engines. On his returning flight, Lt Gavazzi was shot down by friendly fire over Goose Green and killed. His bomb had hit the rear of the ship just above the waterline on the port side; the ship manoeuvered in a tight circle to keep the area exposed while damage control teams plugged the hole. The ship returned home in a reversionary propulsion mode and was repaired in Portsmouth dockyard, returning to the South Atlantic in August 1982, after the end of the war. In later years, Glasgow served on a variety of missions. Glasgow came out of refit in 1989 which took place in Rosyth, her base port. While performing sea trials, issues with the propulsion system and radar meant she had to keep returning to port. 1990 saw her deploy stateside calling in New York and Toronto. In 1991, the destroyer deployed to the Persian Gulf just after the war. In 1992, the warship was sent to the Mediterranean for the first time as part of the NATO naval force, STANAVFORMED. Glasgow was deployed to East Timor as part of the Australian-led INTERFET peacekeeping task force from 19 to 29 September 1999. In early 2004, the ship was deployed on the Atlantic Patrol South tasking. It was announced in July 2004, as part of the Delivering Security in a Changing World review, that Glasgow would be decommissioned in January 2005. 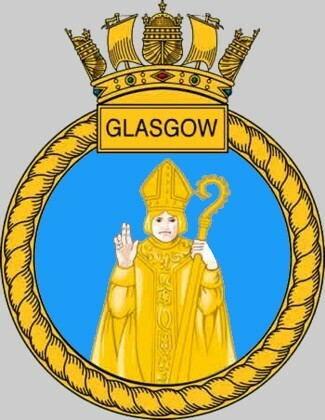 Glasgow was finally decommissioned on 1 February 2005. On 7 January 2009, the ship was towed to Turkey for breaking up.